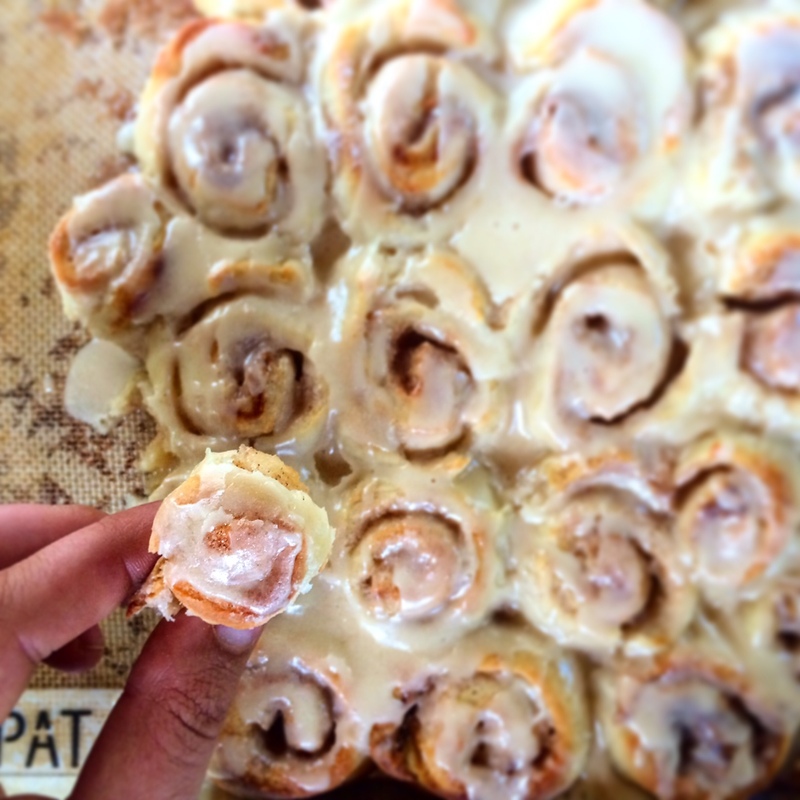 Pull Apart Mini Cinnamon Rolls + News! 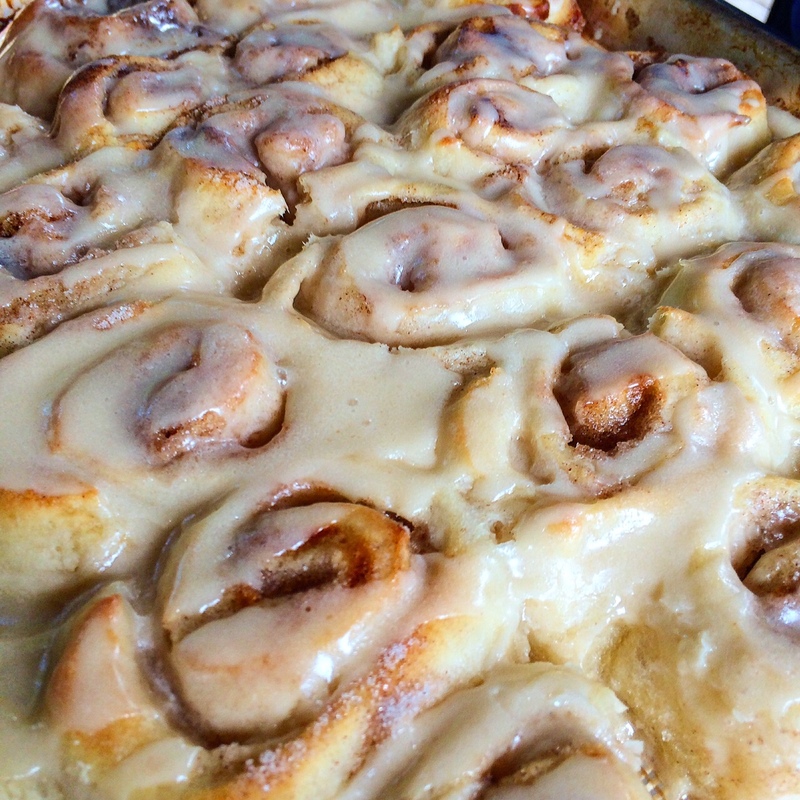 Cinnamon Rolls may be my ultimate weakness. It is hard for me to resist a soft, gooey, sweet roll when I wake up in the morning and am vulnerable…everyone is more vulnerable in the morning, right? 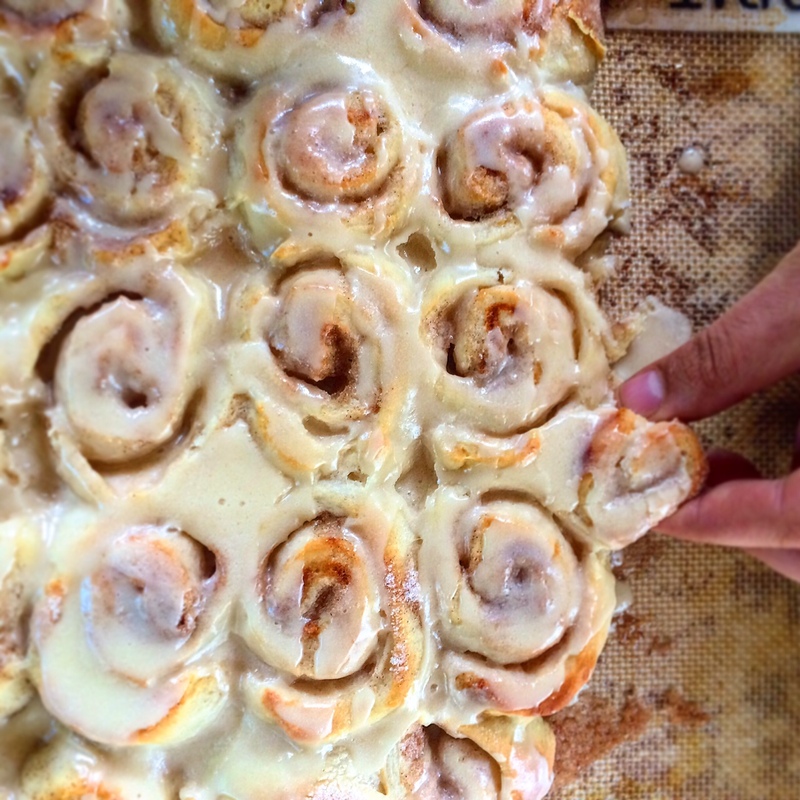 I have been waiting for an “excuse” to find a good go-to cinnamon roll recipe for awhile. One you can tweak with fillings depending on your mood or the season, one that isn’t too complicated, one I’ll use over and over. I’M PREGNANT! Or, ahem, we have a “bun in the oven.” Come on, you knew I would have to announce this in the most cliche way possible on a blog that is mostly about food, right?!? Truthfully though, I was just really excited I finally had an excuse to make cinnamon rolls. PLUS!!! These rolls freeze well, so instead of sending them all to Jordan’s office I’ll be stashing them for the day my life gets so crazy I’ll probably never blog again. So get ready, the next few months I’ll be unloading my hormonal feelings, thinking about freezer meals, and blogging tons of carbs and other delicious foods that I rarely have an “excuse” to make. By now, I’m over the freak out / feeling guilty about everything I eat phase. I’m not going to sugar-coat anything (heh), but the first few months were no picnic. It is so hard to not tell EVERYONE the biggest news of your life right after finding out. I always told myself when I got pregnant I was going to be sooo healthy and perfect about everything I put into my body…but much easier said than done when you feel sick and tired all of the time. I had no idea the first trimester was way harder than the second. I didn’t know about a lot of things, and so many of the books I read and stuff I saw online just made me feel guilty and terrified of every move I made. I was trying to deal with all of these worries and feelings and I wasn’t even really sure if anything was actually in there. What I did know, though, was I never wanted to wear jeans AGAIN. Note for this recipe I made the first half of the dough the traditional cinnamon/sugar way and the second half as JAMMY Rolls. I used our homemade strawberry jam as the filling instead. You can do marmalade, or maybe chocolate…there are SO many tasty filling options I can hardly stand it. The recipe below is for the classic version, but don’t let that stop you from doing half traditional / half jammy. I looove having some variety. Thanks for letting me share the big news with you. Jordan and I feel very blessed and totally terrified. Having a kid seems to be like planning a wedding you have zero control over…You can spend months getting ready for the big day, but you can never really be all the way prepared for the biggest change of your life! For the dough, heat the milk, vegetable oil, and sugar in a medium saucepan over medium heat to just below a boil. Set aside and cool to warm for at least 15 minutes. Sprinkle the yeast on top and let it sit on the milk for 1 minute. Grab a large bowl and pour the milk mixture in. Add 4 cups of the flour. Stir until just combined, then cover with a clean kitchen towel, and set aside in a relatively warm place for 1 hour. After 1 hour, remove the towel and add the baking powder, baking soda, salt, and the remaining 1 cup flour. Stir thoroughly with a wooden spoon (or you can use your hands) to combine. You can use the dough right away, but I prefer to refrigerate it overnight. You can refrigerate the dough for up to 3 days. After removing the dough from the fridge, you can punch down the dough if it rises to the top of the bowl. I used a big enough bowl where I didn’t have to do this. 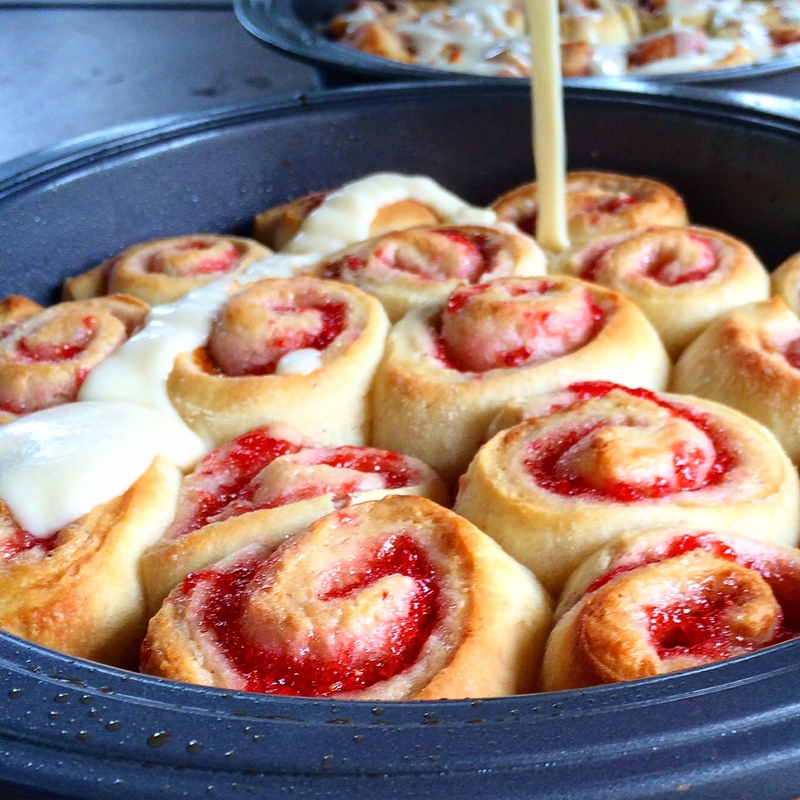 To assemble the rolls, remove half the dough from the bowl. 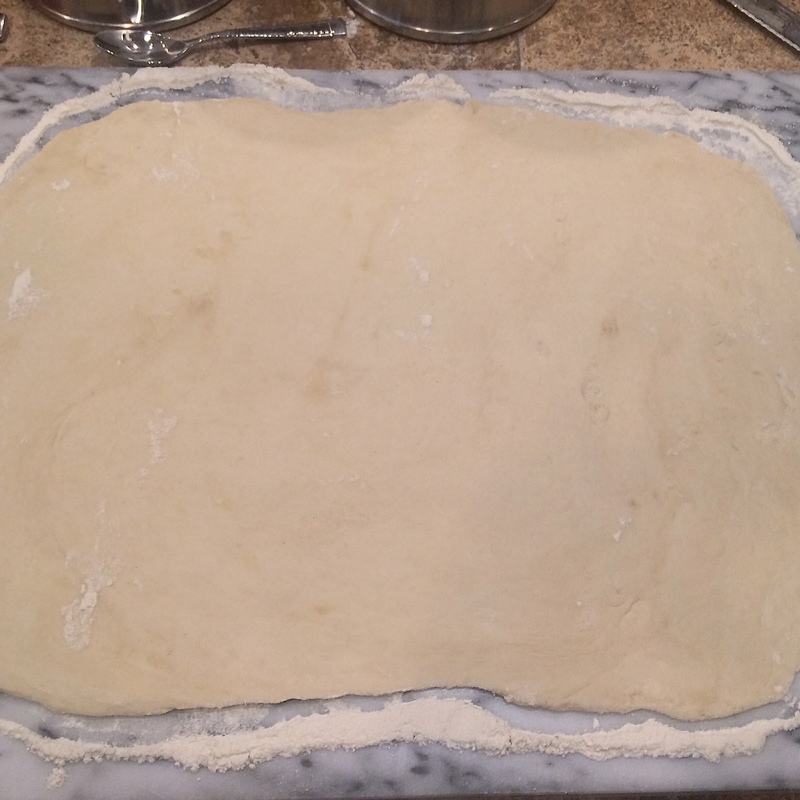 On a floured baking surface, roll the dough into a large rectangle, about 18 x 12 inches. 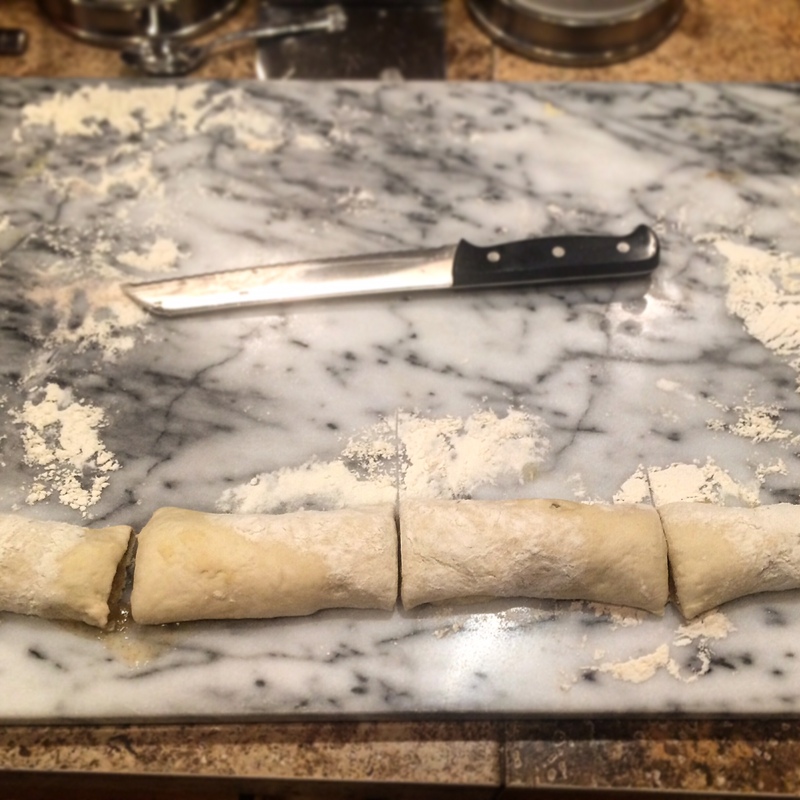 The dough should be rolled very thin. 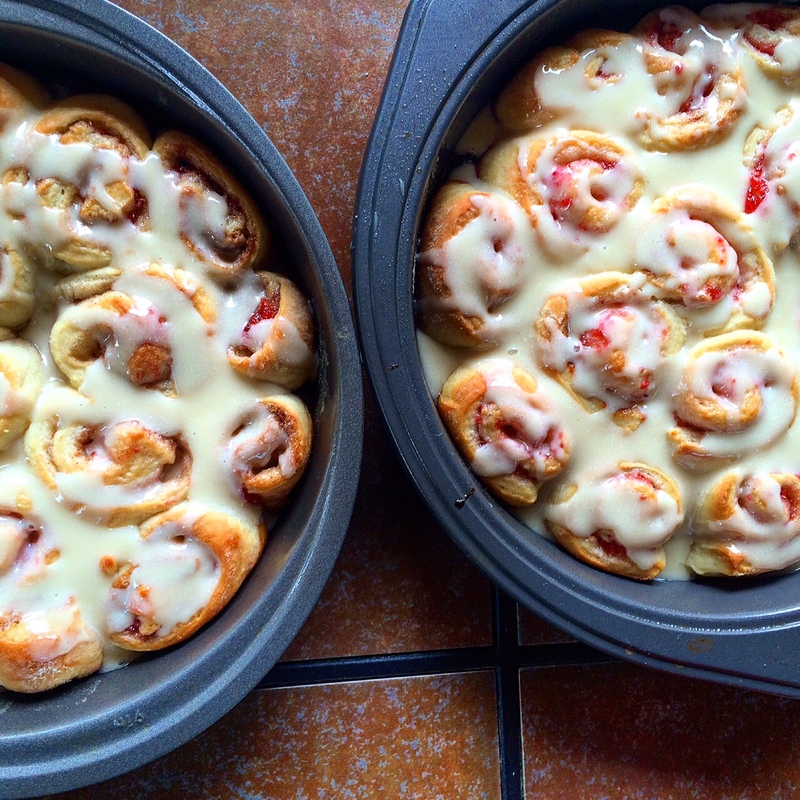 If you are going the route of “cinni minis” cut the dough in half lengthwise. You will have 2 small rectangles of dough now. You can leave the 18 x 12 rectangle whole if you’d like to make bigger rolls, though. 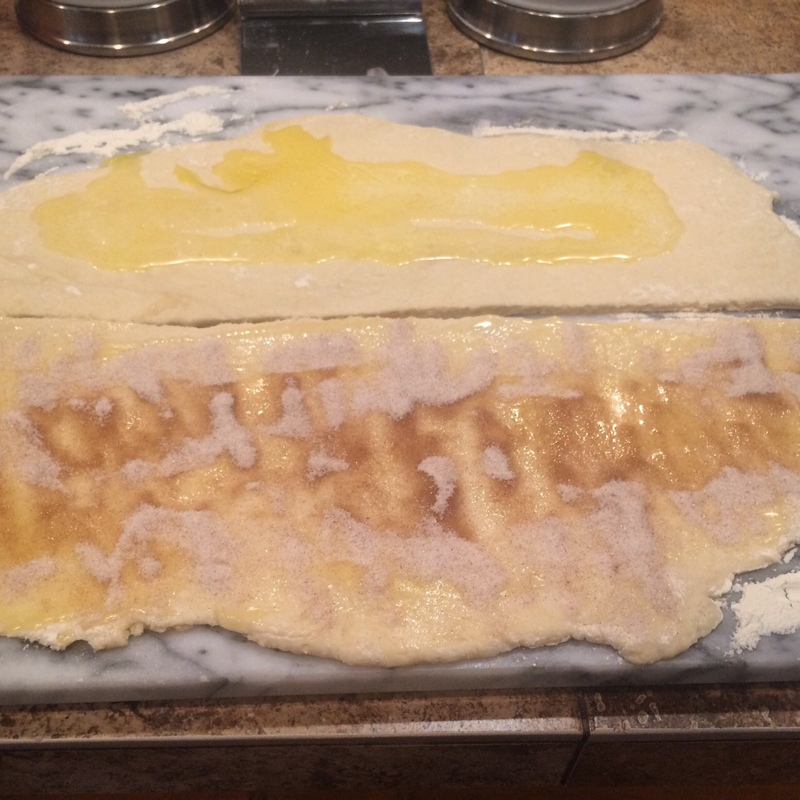 To make the filling, pour some of the melted butter over the surface of the dough. Use your fingers or the back of a spoon to spread the butter evenly. Mix the sugar, brown sugar, and cinnamon together in a bowl. Sprinkle about half of the mixture over your dough. Don’t be afraid to drizzle on more butter or more sugar. 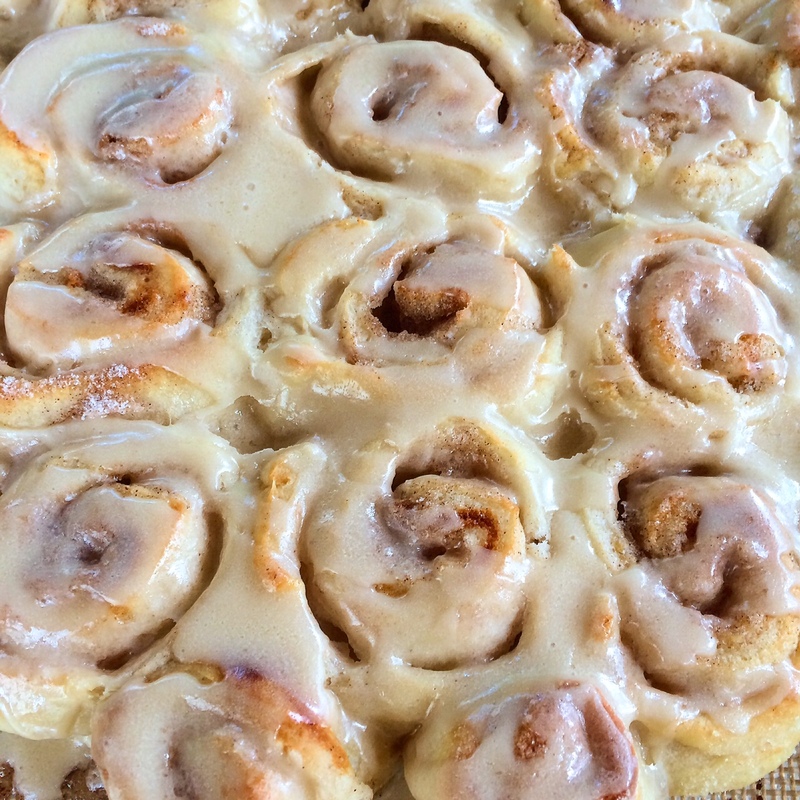 Nobody wants a dry cinnamon rolls, gooey is always better! Beginning at the end farthest from you, roll the rectangle tightly towards you. Use both hands and work slowly, being careful to keep the roll tight. Don’t worry if the filling oozes as you work; that just means the rolls are going to be excellent. When you reach the end, pinch the seam together and flip the roll so that the seam is face down. When you’re finished, you’ll wind up with one long buttery, cinnamon, sugary, gooey log. Cut the log: The best way to cut even cinnamon rolls is to start in the middle of your log. Then you’ll have 2 logs, cut the middle of those…and so on. Know what I’m saying? Continue until you have 16 rolls total. Spray a rimmed baking sheet or round cake pans with cooking spray. 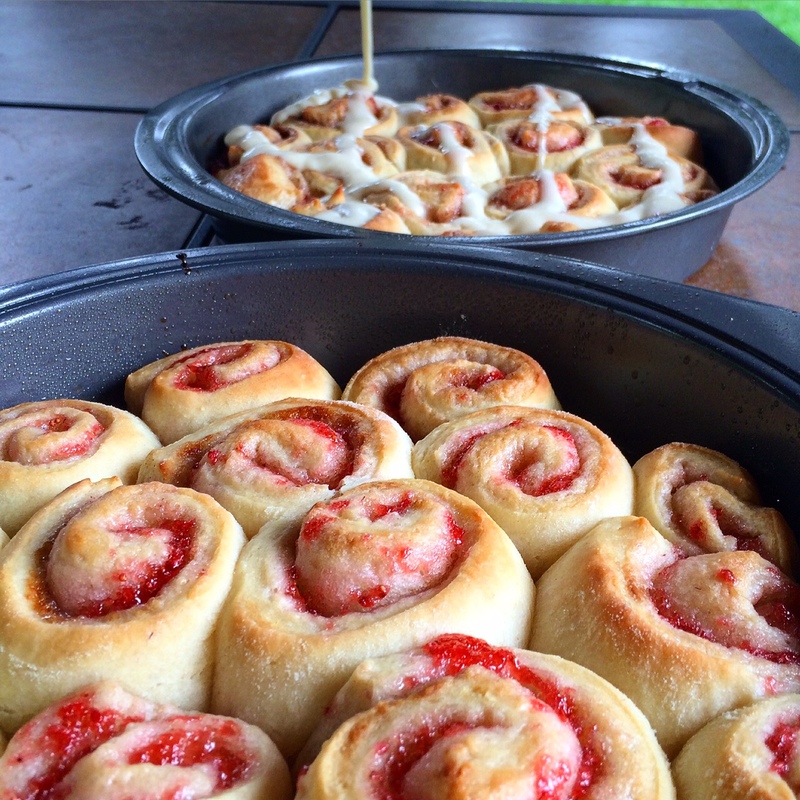 Basically, any pan that will hold your rolls and give them a little room to rise and bake up beautifully together. Square baking pans work great, disposable round cake pans…you get the idea. Repeat the rolling/sugar/butter process with the other half of the dough and more pans. Cover all the pans with a kitchen towel and set aside to rise on the countertop for at least 20 minutes before baking. Remove the towel and bake for 15 to 18 minutes, until golden brown. Don’t allow the rolls to become overly brown. While the rolls are baking, make the frosting: In a large bowl, whisk together the melted butter, powdered sugar, vanilla, salt and milk. Whisk until very smooth. Taste and add in more milk, powdered sugar, or other ingredients as needed until the icing reaches the desired consistency. The icing should be somewhat thick but still very pourable. Remove pans from the oven. Immediately drizzle icing over the top. Be sure to get it all around the edges and over the top. 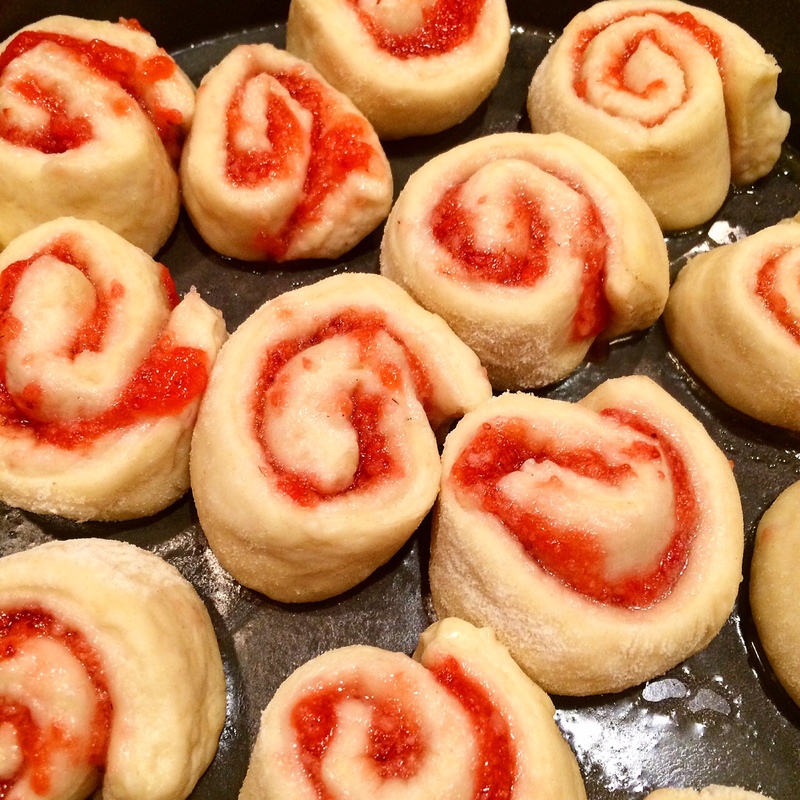 As they sit, the rolls will absorb some of the icing’s moisture and flavor. They refrigerate or freeze very well. 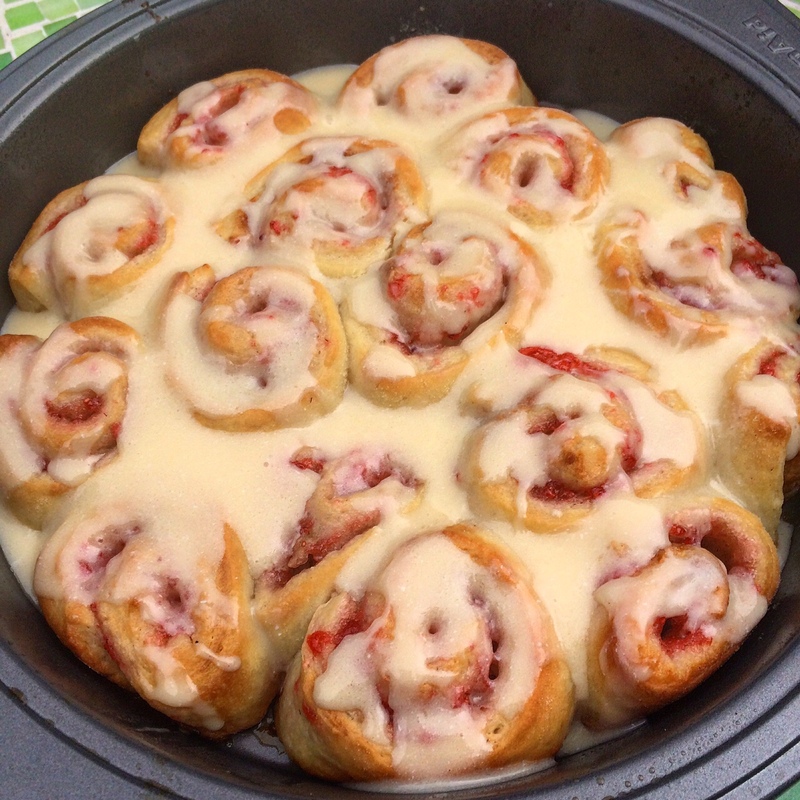 Experiment with other fillings and icings, this is a great base cinnamon roll recipe! I am never cooking again. You do it so much better!